squash is one of the reasons I love fall. 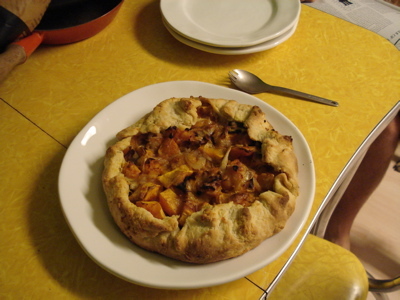 This is one of the most delicious things that has ever been prepared in my kitchen: a roasted butternut squash and carmelized onion galette. Recipe can be found here, at Smitten Kitchen, where the photos are always drool-worthy and the deliciousness is routinely replicable. Thanks, Deb. This entry was posted in kitchen and tagged butternut squash, carmelized onions, galette, june bug socks, kitchen, smitten kitchen, socktober by barefootrooster. Bookmark the permalink. This looks decadently delicious. I love your food creations…and butternut squash is definitely one of my favorite parts of fall, as well!